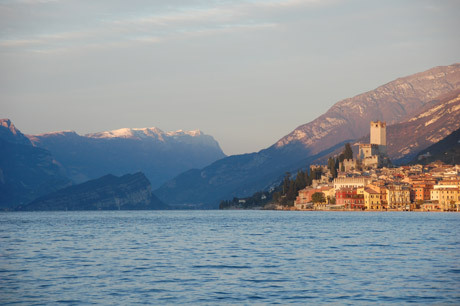 Lake Garda is the largest and one of the most famous of all Italian lakes. Its name is derived from a town situated on the eastern edge of the lake. 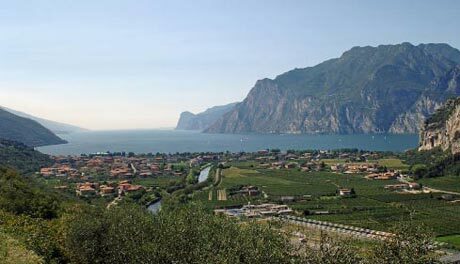 Geographically, it falls into three provinces: its eastern shores in the province of Brescia, western shores in the province of Verona and extreme northern shores in the province of Trento. The northern shore is very spectacular with its high mountains, which face into the lake, whereas in the southern part the landscape is more hilly and fertile surrounded by vineyards and olive trees. This is the birthplace of the Bardolino red wine and in the south of the lake of the Custoza and Lugana white wines. 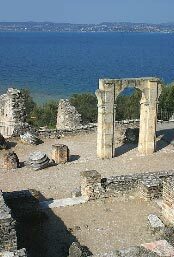 The history of the Lake is also very rich and interesting. Traces of pre-historic settlements have been discovered between the towns of Crero, Albisano and Garda, together with remains of ancient inhabitants such us the Etruscans, the Celts and finally the Romans, who founded their first colonies around the lake in the II century B.C. The Grottoes of Catullus in Sirmione and the ruins of an elegant Villa recently found in the center of Desenzano are two magnificient examples of the Roman presence. In the Middle Ages Lake Garda was dominated by the Scaligeri family, who built four beautiful lake shore castles as a means of defence and which can still be seen in the towns of Sirmione, Lazise, Torri del Benaco and Malcesine. Then, from the early 1400 for almost 400 years, the whole area of the lake was dominated by the Republic of Venice and this is the reason why we can see beautiful Villas lakeshore. Nowadays the lake is a place for tourists with a great variety of hospitality such us hotels, bed and breakfast and camp sites with many different amusement and entertainment parks for children and adults such as Gardaland, Caneva and Parco Natura Viva. 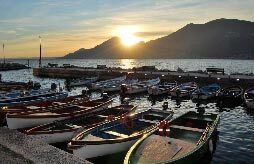 Lake Garda is famous for its mild climate in which lemon and olive trees grow very well and the genuine local cousine made with fresh trout from lake and other local specialities.